Come see where ART is CREATED! 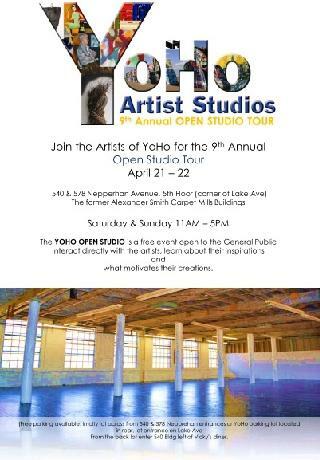 YOHO, Yonker's SOHO, is growing, and welcomes YOU to join its artists to check out FIRST-HAND the creative synergy that takes place in Southern Westchester's LARGEST artist community! YOHO's Annual Open Artist Studio Event is FREE to the general public, and includes artists from all backgrounds: painting, sculpting, collage, photography, music, and much more! This exciting event features live music, guest performances, a reptile petting zoo, food, and over 30 open artist studios! Special live musical spectacles include a performance by David Harewood, a future star in the world of piano jazz, presented by Craftsman Piano. David will perform improvisational jazz on Saturday, April 21 at 2:00 PM. This is YOUR chance and opportunity to explore the blossoming cultural flavor that is unique to Southern Westchester, and learn about the artistic experiences, inspirations, motivations, emotions, and history in the creation of art. You will meet emerging artists in their 20s and 30s as well as mid-career and well-established artists from all over the southern Westchester and the Bronx. (enter from the rear parking lot - entrance on Lake Ave or park in the City parking lot across the street and enter through our new main Nepperhan Ave entrance!